Breaking or losing your teeth can be a painful and sometimes worrying event. If you haven’t had it happen before you might think are no great fixes out there. That’s where dental implants come in. However, there are some common misconceptions that stop people considering them before they even begin. Dental implants in almost every case are the perfect way to replace a lost, damaged or unhealthy tooth. Whether it’s one or many you need to replace, dental implants will come to the rescue. They’re high-quality, long-lasting and feel completely natural from day one. The problem is many people think dental implants are a complex surgery that can be painful, expensive, easy to notice and the same as their Grandma’s dentures. None of these are correct – in fact, in many cases the complete opposite is true! If you’ve lost or broken a tooth and are looking at your options, dental implants could be the perfect pick. Here are the common beliefs you need to know, and why they’re actually false. If you have not had a dental implant before, it is common to think that getting a custom-made tooth is like getting braces, or painting one tooth a different colour. This is not the case at all. Implants are impossible to spot. You probably have a few friends right now who you don’t know have dental implants fitted. Dentists can create dental implants that match the colour and other attributes of your other teeth, making it easy to blend in. If anything, your new tooth will look even more healthy and bright than the one you lost! 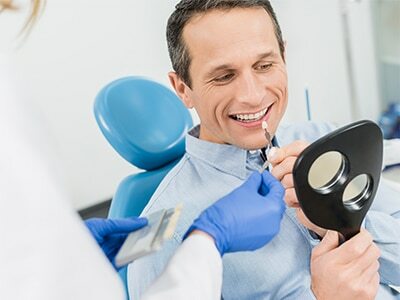 While dental implant surgery may have caused more pain many years ago, these days dental technology has advanced and the procedure for dental implants are now a fast and relatively comfortable one. This is a standard treatment for oral surgeons who are specialists at this as well as general dental professionals, so you will always be in safe hands from start to finish. As with any dental surgery procedure there is will always be a mild level of discomfort. Because the implant is fitted into your gums there will be some recovery time needed for your body to adapt. During the surgery, you will receive the perfect amount of anaesthetic and support from friendly staff to ensure you’re always feeling safe, relaxed and in control. Many people hear the words ‘dental surgery’ and instantly begin worrying about finances. Because Dental Implants are a regular and straight-forward procedure in clinics, it’s surprisingly cheap compared to other, more complex surgeries that can be performed on our bodies-eg cosmetic and augmenting surgery. The treatment is often covered by any private health insurance policy that includes dental. It is true that dental implants and dentures are similar in that they are both replacements for real teeth. But, there are several key differences. Dentures are a custom fit just like implants, but they’re also completely removable. Dentures may sometimes require adhesive materials to keep them fixed inside your mouth. For that reason, sometimes dentures can feel a bit uncomfortable and take a while to get used to. On the other hand, dental implants actually get permanently fixed and anchored inside your mouth, just like a real tooth. It can’t be taken out. They allow you to eat, drink, talk and smile in exactly the same way. You will notice virtually no difference and you will quickly forget they’re even a replacement. If you are a regular smoker or drinker the success rate of your dental implants is a bit lower than otherwise. This actually does not completely remove them as an option. Talk to your dentist and be honest about your lifestyle when discussing treatments for your situation. Depending on the answers, they may still be a good choice for you. Similarly, if you have certain existing dental issues dental implants may not be as effective. For example, if you have low bone density or size in your mouth, it can sometimes pose a problem. If this is the case there are often procedures you can get prior to the implants such as a bone graft to improve the success rate. The best way to check If dental implants match your needs is to find out from a dental professional. If you think an implant is a good option for you, book an appointment at dhealth today.